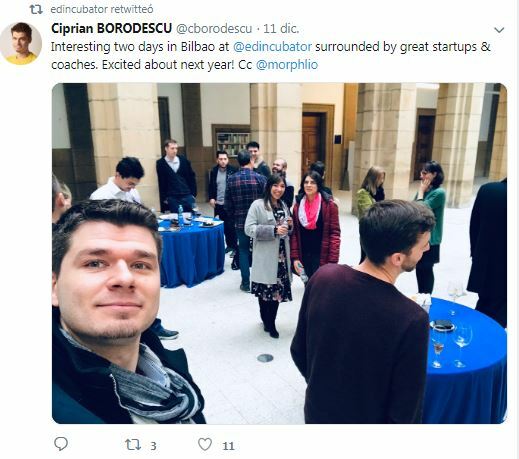 Half-time catch-up: Motivational speeches and coaching for the EDI startups in Bilbao! The ‘Experiment’ phase of the EDI project is thoroughly underway! To keep the startups motivated and maintain momentum when working on their big data solutions, the startups met their coaches face-to-face in this two-day catch up. 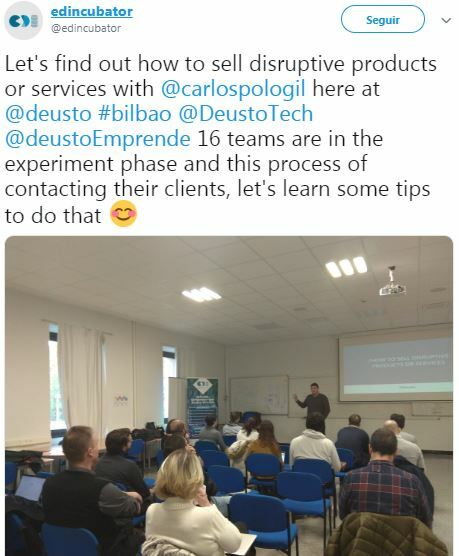 The startups were welcomed to the University of Deusto in Bilbao with a presentation on how they are all doing, and the next steps in the EDI project, by its coordinator, Diego López de Ipiña. The afternoon was followed by a motivational speech by Conchi Ortega, a civil engineer who has 20 years of experience in urban light rail projects all over the world. She has worked in Spain, Portugal, Sweden, Denmark, Colombia, Ecuador, Croatia and Macedonia among 20 countries in tramway LRT projects, as an employee of IDOM, one of the leading European companies in the field of professional services in engineering, architecture and consultancy, established in Bilbao in 1957. 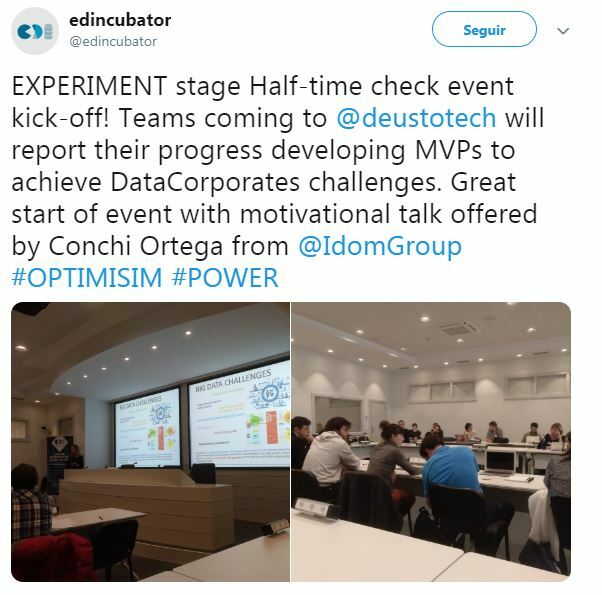 This talk was meant to help teams to become optimistic in unpredictable situations and was an opportunity for teams to share their current progress in the project, as well as the motivations that encouraged them to participate in this European project, European Data Incubator. After the speech, each team met their coach with a bigger smile than before and kept on working. The second day began with a session by Carlos Polo, founder of many companies, creator of a small venture capital fund and a professor at different institutions. This session’s aim was to learn a little bit more about selling disruptive products and services. The teams enjoyed this session very much because he gave many useful tips in order to communicate and gain the attention of potential clients successfully. After this session, each team met their coaches with the purpose of establishing the next steps until the following meeting. 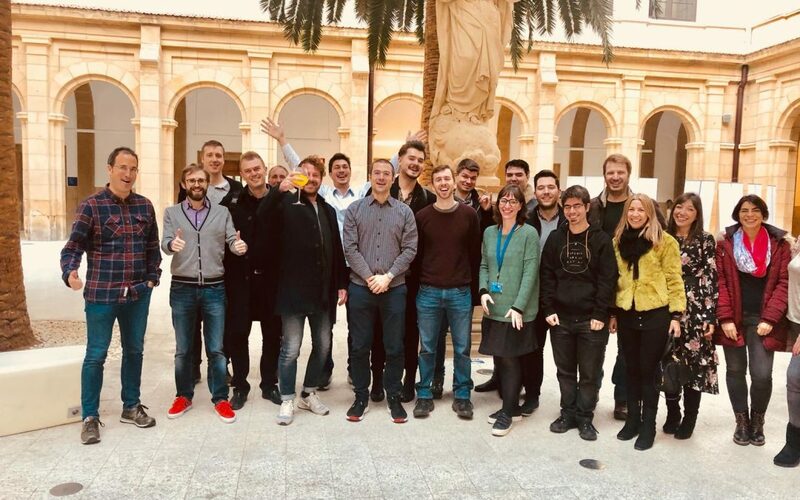 To finish this half-time check, we enjoyed the lunch at the beautiful cloister of the University of Deusto in Bilbao (accompanied by Christmas carols) before the startups and coaches left the city of Bilbao. 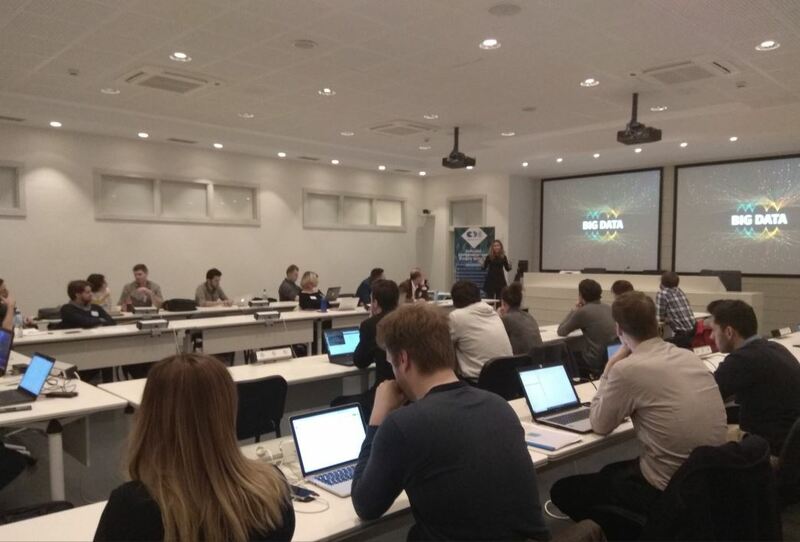 This was the last time that the teams will meet before the final event on 18th – 19th February in Bilbao, where only 6 teams will be selected to participate in the third and last phase of EDI, the Evolve phase. Merry Christmas and a happy EDI year! Follow us on social media to stay updated with our news!